With so many opportunities around the world to play roller hockey, the sport can take these players to some interesting places. In this case Edmonton Inline product Matt Paccagnan has found himself playing College Roller Hockey in the U.S. for Bethel Univerisity in Tennesee. Recently, AMRHA reporter Mike Smith had the chance to sit down with Matt and find out what it's like living out of the country for the first time, going to school and balancing studies with his favourite sport. How did you hear about the roller hockey program at Bethel? How is the game different from what you grew up playing? I heard about Bethel back in 2012 when the program won their first national championship. I saw that there were some Albertans on the team which is what made me realize that playing collegiate roller hockey was something that I wanted to pursue. I would say that the biggest difference in the NCRHA is how physical it is. When guys get in the corners there's quite a bit more contact than I was used to back home. It was an adjustment, but it makes for awesome hockey and gets some fun rivalries going. Did you receive an athletic scholarship or any financial assistance to attend school at Bethel? I do get a scholarship for playing roller hockey at Bethel, which has been very helpful in making this experience possible for me. A lot of people don't know that there are scholarship opportunities out there for roller hockey, and its great to see that the awareness for that is on the rise. I'd love to see more kids from Alberta playing in the NCRHA, especially at Bethel, and I think the new Collegiate Scouting program will help find players in Alberta some opportunities to do so. Is it hard being that far away from home? How difficult is the commute? That’s a good question, that was something I thought about for a long time before making my decision to go to Bethel. It is a little way from home, but I honestly could not be happier that I decided to come to school here. The team took me right in as soon as I came and made Tennessee feel like a second home very quickly. The commute from Alberta is a long one, but after doing it once it just becomes a part of the routine at the beginning and end of the semester. The travel has been a cool part of the whole experience, seeing Tennessee and also travelling all over the states to play with the team has been one of my favourite parts about playing at Bethel. Tell me about your first few practices and games with Bethel. How is the program and your teammates? Good situation for you down there? My first few practices and games at Bethel were really exciting for me in a couple of ways. The first one being that it is a really cool feeling arriving at our team's own practice rink. I could never play roller hockey year-round in back home, so practicing and playing it year round, and having 24/7 access to the rink has been one of the best parts of my experience so far. The first few games were something I had been waiting for for a long time, so it felt awesome to get out there. When new guys join the program, they're instantly a part of the family and I felt that way right away when I got here. Living in Tennessee has been awesome, its a good way to escape the Alberta winters for some better weather. One thing that has really stood out to me is the "southern hospitality" that I've been fortunate enough to experience. When major holidays like Thanksgiving come around, the families of the players in the program are always very inviting to guys who are from further away to come and join their family for the festivities, and that's something I've appreciated a lot, and has really made Tennessee a second home for me. Playing college roller hockey is pretty close to being at the top of the sport, what's it like knowing you play and one of the highest levels of the game? Playing college roller hockey was something I had been looking at as I was about to finish high school, so being able to play here still feels pretty cool to this day. There's a lot of high end players and a lot of competitive schools in the NCRHA and to play against some of the best players in the country has been a really cool opportunity for me. You grew up playing roller hockey in Alberta, how has the team Alberta program allowed you to excel in your development as a player. Describe your experience playing on Team AB in AAU and State Wars. Any favourite moments? I've been fortunate enough to have the chance to play AAU with team Alberta a few times in the past, and every time was an awesome experience. To me, the best part of the Team Alberta program is that it got me some exposure to the style of play in the states, which is at times a completely different animal from the style of play in Alberta. They typically allow the games to get more physical, and playing against kids who purely play roller makes for a change in pace that can take some adjusting to. It is also a lot of fun to play with some of the best players of your age from around the province and getting to know some new people that share the same interest in roller hockey. What can kids in Alberta do to pursue playing college inline south of the border, especially now that we have a program in place to get them more exposure to schools in the states? Your best advice to young players if they want to play for Bethel/ other schools. Finding ways to play in some of the bigger tournaments like AAU, Narch, State Wars, and TOHRS is something I would strongly recommend to anyone playing roller hockey, but especially those who are thinking about pursuing college roller hockey. Coaches, as well as players from various college roller hockey programs are always out there at those tournaments and it is a great way to get noticed, possibly meet some of the program directors and ask any questions you might have about the league or any particular school. 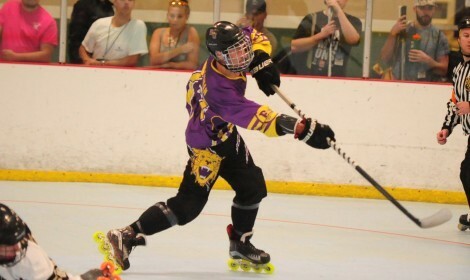 One more thing I'd recommend to people interested in pursuing college roller hockey is to just play as much roller hockey as you can because that is the best way to improve your game, and of course have fun doing it. Anything else you'd like to add about roller hockey and your experiences with the sport. Roller hockey can take you some cool places all around the world and there's a lot of opportunities in this sport that a lot of people don't know about. Like a lot of kids who play roller hockey Alberta, I started out playing roller hockey in the off season of ice hockey just for fun, and now it has lead to this awesome experience of going to university and getting to play the game every day. I think its really important for the game that people know that there are once in a lifetime opportunities in roller hockey, and that it can take you some pretty cool places.